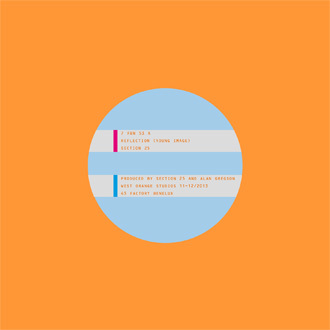 Factory Benelux presents Reflection (Young Image), the brand new single by Section 25, issued in a special limited edition of just 500 copies in orange vinyl to mark Record Store Day on 19 April 2014. Taken from the forthcoming release From The Hip (30th Anniversary Edition), Reflection is a brand new version of this driving dream-pop anthem from side one of the classic 1984 album, which deserved to have been a single at the time. "On first listening Reflection is a whimsical yet heartfelt expression of true love," says Beth Cassidy. "But strip this back and we discover an inner core which explores the surreal nature of life itself. Even after 30 years there are layers to this song that conceal its true meaning." Flipside Change is exclusive to this 7" single and will not be made available elsewhere. "The lyric is the narrative of a changing relationship wrapped up in the music of a changing band," explains founder member Vin Cassidy. The fluorescent artwork and packaging is based on original designs by Peter Saville for the classic 1984 club single Looking From A Hilltop. Available from all good records stores on Record Store Day, 19 April 2014.